However, our modern world is not particularly skin-friendly. Sugar-laden, processed foods; stress and lack of sleep; sun damage; exposure to air pollution and other toxic chemicals, smoking and alcohol are the real villains that significantly impact how your skin will age. While only 10–15 percent of visible aging is directly related to genetics, the much greater percentage is due to these external conditions. What do all these lifestyle and environmental factors have in common? They create inflammation and free radicals! How do you know that your skin is aging prematurely? Check out the presence of lines and wrinkles, increased pigmentation, age spots, loss of elasticity and firmness and dull-looking skin. They are the telltale signs that your skin is under duress. Inflammatory skin conditions such as eczema, psoriasis, rosacea and even acne, are indications that your body is reacting to these toxic factors. When your skin is under stress and showing signs of aging, you naturally seek a skincare product to help protect and renew your skin. But, be careful of the personal care and beauty products that you choose. Many personal care products are, themselves, a major source of toxic exposure that damage and accelerates aging. Did you know, for instance, that over 10,500 chemical ingredients are used to make personal care products? Since this industry is unregulated by the FDA, many of the most common ingredients are known or suspected carcinogens, toxic to the reproductive system, are endocrine disruptors, or damage DNA. The good news is that when you make healthy choices with your diet and lifestyle, it is possible to heal, rejuvenate and regain radiant-looking skin at any age. This is also when a proven skincare product is a necessity for insuring radiant, glowing, youthful skin. An important piece of the puzzle is choosing a skincare formula that is not only toxin-free but also contains effective skin rejuvenating ingredients. First of all, you want to choose a really clean product—one that is fragrant-free, chemical-free and organic. It must have proven ingredients that successfully repairs the skin by reducing inflammation and oxidative stress. It also needs to reduce fine lines and wrinkles, improve hydration and elasticity; minimize skin discoloration and calm skin eruptions. American Biotech Labs, LLC, a four time recipient of Utah’s Best of State company for medical innovation excellence, has formulated an exceptional hand and body skin rejuvenating lotion that assists healing and rejuvenating for all skin types. The patent-pending SilverBiotics® Silver Lotion contains a powerful synergy of SilverSol® Nano Silver, Coconut Oil, Vitamin E and Hyaluronic Acid. The combination of these four ingredients can do wonders for renewing skin that is showing many of the signs of premature aging. It also helps to promote repair and regeneration for skin issues ranging from skin dry, chapped, acne, or other signs of inflammation. Let’s start with a Silver Lotion’s purity. The patented next generation of Nano Silver is the another reason that makes Silver Lotion so amazing. For thousands of years, silver solutions have been used for healing. Thanks to an advanced 21st century technology, a more powerful form of silver is now available in the form of a patented Nano Silver technology, called SilverSol™ by American Biotech Labs. SilverSol™ is a natural powerful pathogen fighting form of silver. It has an extraordinary ability to help eliminate the risk of infection from bacteria, viruses, molds, and yeast as well as enhance the immune system, help provide rapid wound healing, reduce inflammation, and help reduce scarring. It is recognized as one of the safest and most effective solutions for skin rejuvenation. It also is the perfect preservative for a skin care product! And then there is Hyaluronic acid, the fountain of youth for skin hydration and much more! Hyaluronic acid is a natural substance found in your body, with highest concentrations in the fluids of your eyes and joints. It is also a natural fountain of youth that restores moisture to your skin. As you age, skin moisture drops significantly resulting in the loss of elasticity. Hyaluronic acid is able to penetrate the skin’s upper layers where it benefits tissue repair and protection. Topically, Hyaluronic acid penetrates into the dermis, boosting elasticity and hydration. It also helps carry nutrients from your blood to your skin cells. There is one other important benefit. Hyaluronic acid helps to protect the skin from the free radical damage caused by the sun’s UV rays. This means you can reduce your risk of getting those dreaded sunspots with the help of topical Hyaluronic acid. And what about those wrinkles? Researchers have found that Hyaluronic acid is correlated to measured increases in skin moisture. Microscopic skin surface analysis revealed increased skin smoothness and reduction of wrinkles. In fact, Hyaluronic acid is a real super star when it comes to skin rejuvenation. It has the unique ability to attract and retain more than 1,000 times its weight in water! That’s a lot of plumping up, naturally! Hyaluronic acid is definitely your best friend for helping to turn back the clock. Vitamin E comes to the rescue as the super-duper, anti-oxidant fighter against premature aging. Vitamin E is a fat-soluble antioxidant that is essential for the maintenance of healthy skin. Free radicals caused by a variety of environmental factors including UV radiation, pollution, tanning, smoke, and environmental heavy metals wreak havoc on our skin. A powerful free-radical scavenger like vitamin E is an important rejuvenating ally that protects your skin from this daily free-radical onslaught. Vitamin E, however, offers much more than just is antioxidant protection. It has also proven to be effective in reducing sun-induced skin wrinkling as well as having excellent skin moisturizing properties. The sun’s UV rays also pose a threat to your DNA. The use of vitamin E protects against the degeneration of DNA. Sun spots and loss of elasticity are a direct consequence of DNA damage. But that’s not all that vitamin E contributes to healthy skin. An added benefit is that it helps to increase the natural moisture content of the skin. As skin ages, the turnover of cells and the production of collagen in them begins to slow down. This, in turn, causes the skin to lose its firmness and elasticity. While that may sound depressing, here’s the good news! Vitamin E will encourage healthy collagen production! Vitamin E is one of mature skin’s best friends. As you age, the more your skin needs extra protection from free-radical damage as well as support to enhance tissue repair. The coconut oil in Silver Lotion has been praised for its anti-aging properties for ages! Traditional cultures have understood that coconut oil is far more than just a culinary ingredient! For thousands of years, coconut oil has been renown as a healing, rejuvenating and moisturizing oil for the skin. Why is coconut oil so effective for healthy skincare? In part, it is due to the saturated fats that help the skin stay, soft, glowing and well moisturized. It also prevents the loss of moisture through the skin’s pores. Coconut oil helps to revitalize dry, flaky, dull-looking skin. It is quickly absorbed into the skin making your skin feel silky smooth and well hydrated to the touch! Coconut oil also contains vitamin E as well as being rich in proteins. Both of these contribute to cellular health, tissue repair and anti-inflammatory protection. Coconut oil has additional healing properties. It provides antibacterial antiviral and anti-microbial protection. This enables coconut oil to help to heal and protect the skin. L-arginine is an amino acid. While is found as a dietary supplement, it gaining in popularity as a topical ingredient in various skin care products. L-arginine is a precursor to nitric oxide which enhances blood flow. When used in topical formulations, the improved blood flow increases the ability for more nutrients to get to the cells and thus, more healing. L-arginine serves one other important purpose. In order to insure that SilverBiotics®Silver Lotions remain totally chemical-free, L-arginine was chosen to help maintain pH levels rather than other unnatural ingredients. The unique formulation of the SilverBiotics®Silver Lotions addresses the needs of the entire family. Because of its organic, chemical-free ingredients, not to mention the powerful anti-inflammatory, antimicrobial and antioxidant benefits, the entire family can benefit. Everyone can benefit: From infants with delicate skin, to teenagers with acne, to fathers with dry, chaffed hands, and mothers and grandmothers needing extra rejuvenating support to maintain their youthful appearance. There are two versions of the lotion, both made with the same ingredients. The difference is the texture of the lotion. The Hand and Body Lotion which has a lighter feel that can be use to moisturize the entire body, including the face. The Advanced Healing Skin Cream uses more coconut oil to create a thicker, richer cream that can be used on those really rough, dry places such as the elbows, heels or even chapped lips. Some people prefer the Advanced Healing Skin Cream as their daily face moisturizer. Whichever lotion you choose, your skin will love the results. 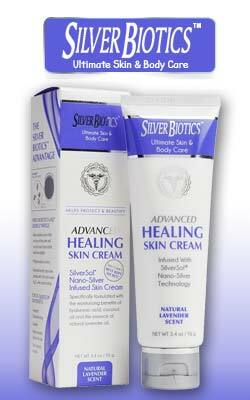 The SilverBiotics® Silver Lotions, Hand and Body Lotion and the Advanced Healing Skin Cream, bring you the most innovative, superior quality and proven skin healing and rejuvenating ingredients, at the most affordable price. Renew, repair, regenerate and revitalize your skin with the patent-pending SilverBiotics® Silver Lotions with SilverSol Nano Silver, Hyaluronic acid, Vitamin E, Coconut Oil and L-arginine. SilverBiotics® Silver Lotions give your skin a new lease on life. You will love them and so will your skin!